The sub-4 metre sedan segment has seen a resurgence of late with most of the players having received various updates in recent years. The Dzire is the current king and even managed to outsell the Alto, making it the best-selling car of 2018. 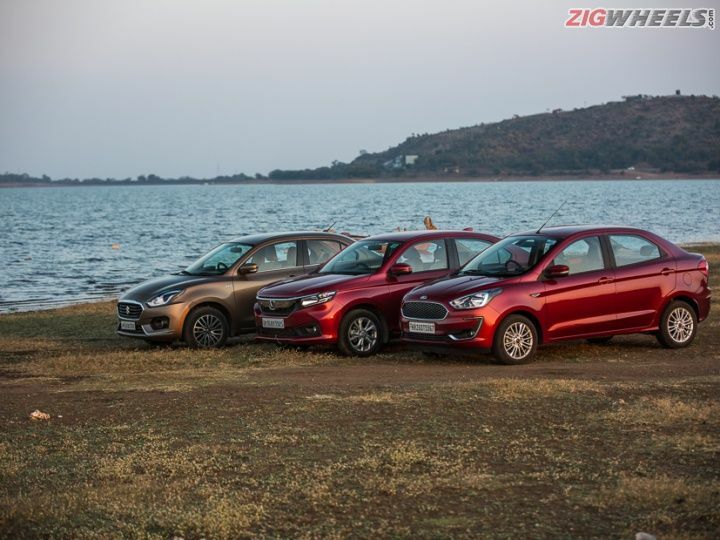 We’ve been here before but this time around we’re taking a look at petrol power, pitching the leaders of the pack - the Maruti Suzuki Dzire and the Honda Amaze - against the newest refresh of the lot - the Ford Aspire. In this segment, looks matter. With this update, the Aspire only received a facelift and a mild one at that. This means that it stutters out of the gates against the Dzire and the Amaze who have both seen generation updates recently. That said, there’s nothing wrong with the way the Aspire looks. In fact, the Aspire was the first player in the sub-4 metre sedan segment that really looked like a sedan from the ground up rather than a modified hatchback. But that was back in 2015 and now both the Dzire and Amaze look equally well designed and also sport features like LED DRLs that really make them stand out; which is quite significant in a class that primarily appeals to the aesthetic sensibilities of its customers. The Honda gets LED DRLs but little else. However, its sharp looks are its standout feature and are a big improvement on the old car. It’s new character may be little ‘love it or hate it’, but just the fact that it’s different means it stands out more. The Dzire’s soft lines and proportions are a complete contrast from the Amaze but it stands out for the flash it has on offer. With two-tone alloy wheels, LED DRLs and even LED headlamps in this Zxi+ variant,, it’s certainly the loudest car out here. And while the former two features add pure aesthetic value, the LED headlamps are brilliant for driving in the night and are the best in the segment. The interiors and features are also important as these cars now have to give their owners that true ‘badda gaadi’ experience. Gone are the days when the sub-4 metre sedan segment was just a dimensional step up from a hatchback. The Dzire brought many first-in-class creature comfort when it launched in 2017, forcing everyone else to play catch up. Not only do they need to look the part of being a badi gaddi, they have to now sport similar levels of space and luxury as well. In terms of features, each of these cars pack quite a punch. In each of their top-spec variants, all of them feature climate control, touchscreen infotainment systems, steering-mounted controls, push-button start/stop, rear parking cameras, two airbags, and ABS with EBD. The big visual change in the Aspire is the addition of the new SYNC3 touchscreen infotainment system. It looks brilliant, is the easiest to use out of the three and works flawlessly. Unfortunately it’s one of only a few visual changes. The rest of the Aspire remains quite the same as the old car. Its cabin pampers front seat passengers with generous legroom, ample storage areas and well cushioned seats. Sadly, it’s missing the leather seat covers that the outgoing model had. Truth be told, although leather seats would have made the cabin more upmarket, fabric seats are a more sensible option in our weather conditions. In the rear, the Aspire is less accommodating than the other two cars on test. It packs the least effective knee room and no AC vents, 12V power outlets or even storage areas in the doors! There’s one lone bottle holder between the front seats and any cups would have to be stored in the holders provided near the handbrake, which is quite a stretch. That said, the seats themselves are firm and flat, and this gives the Aspire the ability to seat three abreast in the rear better than the Amaze or the Dzire, despite the measurements saying otherwise. The Aspire does sport some standout features as well. The headlamps and wipers turn on automatically and the IRVM is gets the auto-dimming feature. So it does sport enough equipment that add to its upmarket feel but unfortunately, the hard plastics and the fit-and-finish will let you know that the Aspire does lie at the budget end of the Ford lineup. Where it stands head and shoulders taller than the competition is in safety and this top-spec Titanium+ variant comes with six airbags, which is a first in the segment. The Amaze also sports a new touchscreen with its new DigiPad 2.0 interface. This is a much more intuitive system compared to its predecessor and since it’s Android based, it’s screens and widgets are customisable too. On the space front, the Amaze appears to have more legroom than its predecessor. Honda seems to have achieved this by moving the front seat adjustment rails forward, sacrificing maximum front legroom for more space in the rear. This has done the trick and while there is more than enough room for six-footers in the front, rear passengers have a tad more room than in the Aspire. Storage space is also better thought out than in the Aspire, with bottle holders in the doors and cup holders in the drop down armrest as well. There is even a 12V charge socket for rear seat passengers. The one feature that the Amaze sports (only in this petrol-manual variant and surprisingly missing from the automatic!) is cruise control, which is missing in its rivals. The feel of the materials, the soft cushioning, the design and layout of the dashboard and the MID, all come together to make you feel that you are in a well thought out, upmarket car. The Dzire is now the oldest design here but it has aged well. The faux wood inserts on the dash, door trim and the flat-bottom steering wheel do a good job of simulating that old-school luxury look. For sub-4 metre sedans, each of these cars pull off TARDIS (The phone booth from Dr Who that’s famous for magically being larger on the inside than on the outside) like feats. But in the Dzire, the illusion is the most dramatic and the sheer legroom in the rear could shame some true luxury sedans as well. It has the most usable leg room for both front and rear seat passengers - achieved by clever packaging and a thoughtfully designed dash that frees up as much knee room as possible. It’s practical as well with just as many storage options as the Amaze and also bundling in dedicated aircon vents for the rear. The only complaint we had was that the armrest could’ve been a little longer. Also, while space is ample, the large headrests at the front and rear as well as the higher shoulder line don’t amplify this feeling of space. The other issue we noticed was that the door armrests tend to eat a little into cabin space and this inhibits its ability to seat three in the back as easily as the Aspire or the Amaze. It’s still the most comfortable car of the three for four passengers. The Dzire also has its own list of standout features like automatic headlamps with LED projector units. These are brilliant in the night and improve the night driving experience in spades. So does big car looks entail big car ride quality? Sadly the short answer is no, but it’s not all bad news though. Like in the rest of the test, they are all closely matched but still are quite distinct in the way they tackle our challenging road conditions. We’ll start with the big softie of the bunch - the Amaze. Its suspension soaks up the worst that the roads can chuck at it. Those living in Tier I and Tier II cities as well as people who spend a lot of time commuting over poor roads, this is the car for you. The Amaze keeps things comfortable at slow city speeds and the suspension stays fairly quiet while it works too. As speeds increase though, the Amaze does tend to get a little bouncy and it does take time for the car to settle after hitting a bump at highway speeds. The Aspire sits in the middle. It’s quite good at city speeds, though not as comfortable as the Amaze. But it does handle the bigger bumps better and even at highway speeds, it’s cabin manages to stay composed. The only area that the Aspire falls behind is in going through corners. The roll is a little more pronounced and mid-corner bumps tend to unsettle the cabin a little more than they do in the other two cars. The Dzire sports the most balanced suspension setup of the three. While it feels a little firmer than the Amaze, it’s still quite comfortable in the city. It also manages to be more composed of the three at highway speeds. If you like spending time behind the wheel when the roads get twisty, the Dzire is the car to be in. The one complaint we did have though was that bumps tend to be heard more than they are felt. Performance is secondary but efficiency certainly isn't, especially when it comes to these petrol-engined cars. They all sport 1.2-litre petrols to make the most of the sub-4 metre category restrictions. The Aspire’s Dragon series engine makes do with one less cylinder than its rivals, though. This engine really wow’d us when we experienced it in the Freestyle but Ford has geared the Aspire taller and this has dulled the response from the thrummy 3-cylinder to some extent. In town, it’s quite flexible but when slowing down for speed breakers, you will find the need to shift down into first when pulling away where second gear would have been enough in the Amaze or the Dzire. It’s also more audibly thrummy sounding than the smoother 4-cylinder powerplants and there are some vibes that make their way in through the floorboards as revs rise. What the taller gearing does manage to do is keep it one of the more efficient cars on the test, if only by a small margin. It managed 15.92kmpl in the city and 19.52kmpl on the highway. The Amaze is smoother but louder. Though Honda have considerably improved sound insulation on the Amaze from its predecessor, engine noise is the loudest of the three. The i-VTEC powerplant is very linear and while it was lackluster in the bigger WR-V, it feels like its gained a little bit of punch in the lighter Amaze. It’s more flexible than the Aspire and is ever so slightly better to drive around town. It could have been a lot nicer than the Aspire if it wasn't for the steering and the brakes. The steering feels unnecessarily weighty and a little vague, while the brakes are very spongy and this dilutes the driving experience considerably. The clutch pedal for a petrol-engined car is also on the firmer side and you will feel your leg muscles in stop and go rush hour traffic sooner than in the other two cars. For a manufacturer that was known for pleasing enthusiasts, the Amaze feels very un-Honda like. In terms of efficiency, the Amaze is on par with the other two, at 15.14kmpl (city) and 20.1kmpl (highway). The Dzire is the surprise package here. The smallest engine with the least power on paper is actually the quickest in outright acceleration from a standstill. In day-to-day usability, which is evident from our third and fourth gear roll as well, the Dzire is also more punchy. This is down to the better gearing in the Dzire, which makes it nicer to drive in the city. Also helping city manoeuvrability is the nicely weighted steering, which is quite direct as well. Despite the better performing engine and gearing tuned for better driveability, the Dzire was the most efficient out on the highway. It eked out 15.85kmpl in the city and 20.90kmpl on the highway. The simple answer, by just looking at the spec sheet, is the Titanium+ variant of the Aspire. Equipped with six airbags, is clearly the car you want to be strapped into in an accident. As far as other variants are concerned, each of the three cars have ABS and dual front airbags as standard. The longer answer is that none of the three have been crash tested in their current form and even though their platforms have been tested before (3-star Global NCAP rating for the Ford Aspire pre-facelift with two airbags, 2-star Global NCAP rating for the Maruti Suzuki Swift 4-star ASEAN NCAP rating for the 2016 Honda Amaze), there is no telling for certain which of these sedans in the safest in the lower variants. Does the Dzire keep it’s crown then? Taking everything into consideration, the Maruti Suzuki Dzire still manages to outshine the competition in terms of space and class leading features - one of the key considerations of the sub 4-metre sedan segment. It's also fun to drive but it's also the most expensive of the three at Rs 8 lakh. If you are looking for a petrol-manual that fulfils all your ‘badda gaadi’ dreams, then it’s worth the premium and you need look no further. The Ford Aspire, on the other hand, does offer the best value of the three and also features the best safety package. It does have a few misses in cabin quality, space and creature comforts, but is a bargain at Rs 7.24 lakhs. If safety is your paramount concern and you can do without some frills, then the Ford is your best bet. The Honda Amaze is the better car in the city, has a nice pleasing upmarket feel to it’s interiors and is spacious as well. It’s also more expensive than the Aspire, at Rs 7.68 lakh, but is a great choice if most of your driving is done in the city. In the end, we have to point out once again that this comparison is only for the petrol-manual variants. If you are looking at diesel as your choice of fuel, then check out our diesel-powered segment comparison here. If you are looking for an automatic, then Ford and Honda sport better, more sophisticated torque convertor and CVT gearboxes, respectively, compared to the AMT transmission from Maruti. You can read our review of the Honda Amaze diesel-automatic here. One thing, I feel you guys need to reorder the pics as per the narrative. You can't have pics of Amaze exterior when talking about Aspire interior. Neither can you have pics of Dzire interior when talking about Amaze. One thing, I feel you guys need to reorder the pics as per the narrative. You can't have pics of Amaze exterior when talking about Aspire interior. Neither can you have pics of Dzire interior when talking about Amaze.